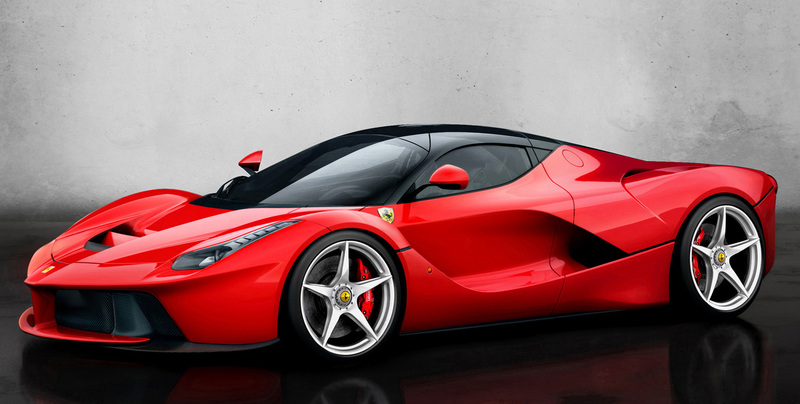 The LaFerrari needs few superlatives. It is our most ambitious project yet, pushing the boundaries of technology for a road car. It gathers together the marque's greatest technical capabilities from both GT and Formula 1 engineering, delivering the highest performance ever reached by a production Ferrari. And yet, the cause is noble. All this advanced technology will filter to the rest of the Ferrari model range. As Ferrari’s first production car powered by the F1-derived HY-KERS hybrid drivetrain, it combines a 161-hp electric motor with the most powerful Ferrari V12, itself making 788 hp at 9000 rpm, for a power sum of 949 hp and 663 lb-ft of torque. Airflow heavily influences the body's sculpture. Elegantly-hewn forms communicate enormous power and aggressiveness, particularly at the wheelarches. The front wears a low wing that appears suspended on a central strut beneath the nose, clearly inspired by F1. Surfaces and texture flow front-to-rear over the cockpit, always serving an aerodynamic master. This fluid surface treatment gives the low drag and high downforce characteristics needed while also channelling air to cool hot components. What makes the LaFerrari concept so innovative is the use of active aerodynamics as a tool for the car’s other dynamic control systems, delivering a breakthrough in overall performance not possible if both were independent. Integration of active aero with the dynamic controls and systems make even better use of the downforce and aero balance gains. The LaFerrari has an extremely compact frontal area for low drag and the greenhouse shape helps airflow reach the rear air cooling intakes. The LaFerrari’s driving position draws heavily from F1 influence, with Scuderia drivers directly involved in design and development. The cockpit clearly shows its motorsports origins, yet marries tradition and modernity. The driving position turns normal road-car conventions on their head. The seat is fixed in position. Both the steering wheel and pedal box adjust to meet the driver’s hands and feet. 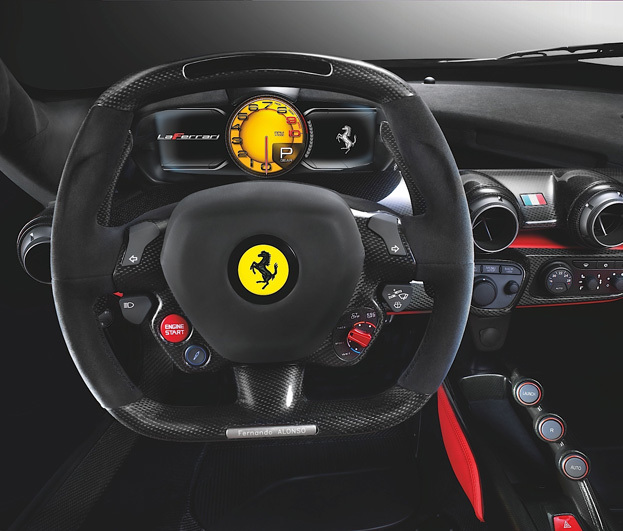 The steering wheel shows in-depth research and development tied to motorsports with the LaFerrari's various functions integrated in Formula 1 fashion. Designers lengthened the gear-shift paddles, making them more ergonomic. The gearbox control's bridge in the center of the cockpit takes on a suspended wing shape. Lastly, the instrument panel's secondary controls for audio, navigation, climate and telemetry are located on the door and the center of the dashboard, highlighting the mission-critical controls directly in front of the driver.